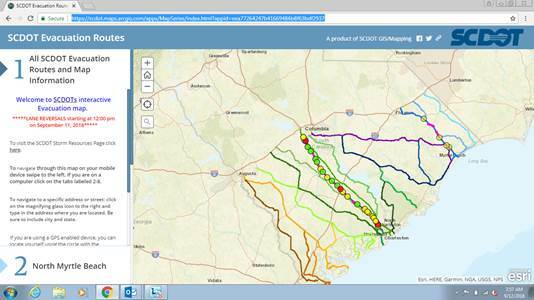 SCDOT is closely monitoring the forecast for Hurricane Florence and prepared to make any shifts as required by Gov. McMaster. Traffic is currently flowing well. Lane reversals on I-26 and US 501 will be kept in place as long as they are still being used or winds reach tropical storm force. We will be closely monitoring traffic levels and the forecast. Drivers evacuating the coast should fuel their vehicles before leaving, drive carefully, be patient, and expect some congestion. Evacuation routes and info on lane reversal can be found here. Drivers using the I-26 lane reversal should watch the explanatory video here. The SCDOT Call Center is open and standing by to offer assistance with evacuation routes: 855-GO-SCDOT (855-467-2368). Encourage drivers to use the SC 511 system for traffic info: www.511sc.org. Sign up for Eddie’s newsletter! Keep in touch with the latest from the State House. Subscribe to Eddie's newsletter today!